Hello new love of my life. For my birthday, Andrew bought me a serger. 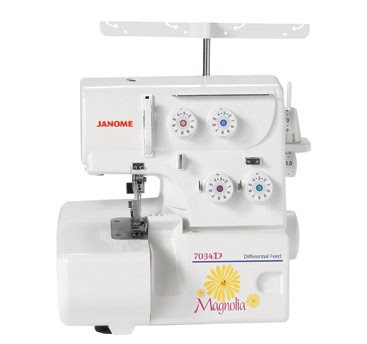 I am a big Janome (pronounced jah-no-me) fan and am so glad I have a matching serger to go with my Janome sewing machine. This is a four thread serger so it can't do hems, but I am estatic about everything else it can do. I have started three sewing projects since I got the machine (last Friday). I will post pictures once I have finished them. Of course I started with a girl's dress pattern, but I am now working on some short overalls for Blake. I feel like there isn't enough time in the day to finish all the projects I want to work on. Yesterday, I purchased a 24-Hour Fitness membership from Costco (you can save $320 off a membership by buying it at Costco) so my time is going to be even more limited for sewing projects. One of the reasons I signed up for the gym is to get my mind off of the fact I had my third miscarriage since having Blake. We have an appointment with our OB in July to try and pin point what the issue may be. My miscarriages have been super early so I never get too attached to each pregnancy. I am learning a huge lesson about living in the moment instead of trying so hard to follow the dreams and hopes I make for myself. Everyone who knows me knows how much I dislike doctors so I am dreaming that he will tell me to exercise, relax, and wait to try again until I wean Blake completely. More likely he will request blood work (I call it bloodletting) and discuss hormone imbalances. I was so excited to do everything naturally so we will see how it goes. It is weird how I crave physical activity when I am trying for a baby. Remember how I had to work 20 hours a week at a horse barn before I had Blake. I reminded myself of the lesson I learned that 20 hours of intense barn labor actually fatigued me and once I quit the job I finally got pregnant. Life is one big vicious cycle right? "I call it bloodletting". LMAO!